Sitting at the shore of the splashing Saalach river is an incredibly relaxing experience. 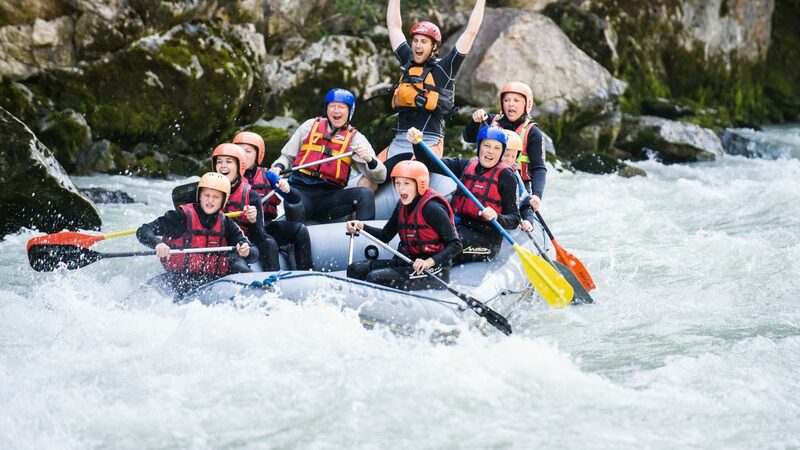 But the water can take on completely different shapes and forms in Salzburg’s Saalachtal valley, which makes it a real playground for adventure fanatics when it presents itself from its more powerful side. Through the tight ravines, across wild waves, on calm swirls and jumping right into the icy water in the darkest of canyons. I love water! Water sports of any kind have always attracted me to the wet elements. Until now, however, it was primarily the crystal-clear lakes of SalzburgerLand that set the stage for my athletic endeavours. So, it’s about time to hit the next gear and to go for a shot of adventure, adrenaline and water sports in Salzburg’s Saalachtal valley. 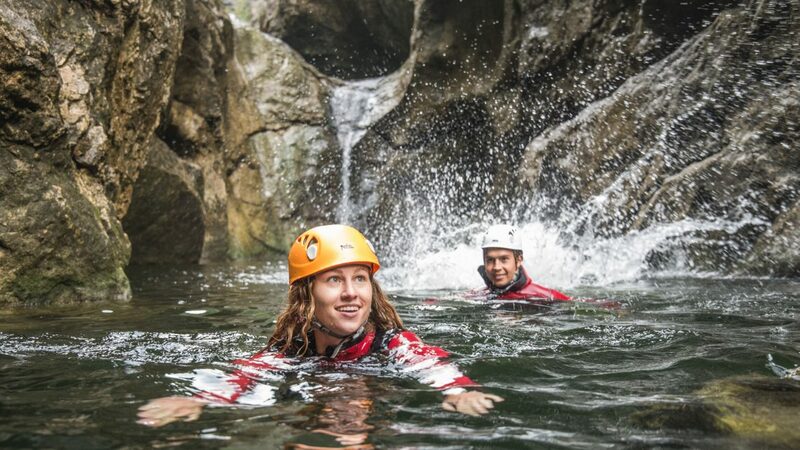 Rafting, canyoning and a kayak tour are part of the programme. A thick wetsuit and a swimming vest will be my best friends for the next couple of days as I make my way through the vicious floods amid Unken, Lofer, St. Martin and Weissbach. The rafting tour will, in culinary terms, be the appetizer to my adventure menu. “Whitewater fun guaranteed!”, says our guide, as he teaches us the basics of how to operate the large, robust rubber raft. With paddles in our hands, we practice our movements in the dry, because once in the boat it’s teamwork or go home. With the boat at the hanger, we are shuttled to Au, where we get ready to hop into the water. As we jump into the water with our wetsuits, swimming vests and helmets to cool down a little, our guide announces, “We will pass by the ‘Auer-Loch’, the ‘Magnetstein’, the ‘Prallwand’ and the ‘Waschbrett’ until we get to Unken.” I don’t even want to start imagining what these names mean for our journey and I’m happy when we finally carry the boat into the water. Eight of us take a seat in the rafting boat — four participants per side. Our guide sits all the way in the back, who starts handing out one loud command after another right after getting in. “Everybody, forward!”, we hear and immediately stick our paddles forcefully into the water. Support is provided by the footstraps on the base of the boat. The current pulls into the centre of the river and the boat accelerates in no time. The greenish shimmering water still seems quite tame and, slowly, we get used to the rocking. But, further ahead, we can see the first white foam — a sure sign that our ride is about to get a whole lot wilder! The fun begins and we bump and jump through the currents. Obediently, we listen to our guide’s every command and thus make our way safely around bigger waves and edgy rocks that protrude from the Saalach river’s bed. After some time, we head for a calm swirl and decide to take a short break on land. From the top of a tall rock, we jump into the current and let ourselves drift for a few metres before climbing back to the shore. Back in the boat, we enjoy the remaining journey through the wild waves all the way to Unken. After our first day in the whitewater, none of us can contain the grins on our faces and our hunger for the main course — the canonying tour on the next day. Already at our meeting point for the canyoning tour, our guide can’t stop raving about it. “We will hike through a picturesque, water-bearing canyon, swim in whitewater, rappelling across waterfalls, glide across natural rock slides and, as our highlight, jump into a crystal-clear rock pool!” So, time to get back into the thick wet suits and put on the swimming vests. Equipped with helmets, neoprene gloves and canyoning waist belts, we go on our way. Slowly, we dive into the dark depths of the ravine. Whereas the heat of the summer sun had just summoned sweat drops on our foreheads, we now enjoy the refreshing coolness and millions of tiny water drops surround us in the form of spray mist. After a sign from our guide, we slowly, step by step, move ahead in the crushing floods. I feel the mighty pressure of the water on my calves and admire the force of the water that has dug its path into the hard rock over thousands of years. The water starts getting deeper. We’re now moving forward by swimming and glide across the natural tracks of the slippery rock. Laughing, we let ourselves be taken by the current like driftwood. Loud noises announce a waterfall that is, thanks to our guide, safely conquered with a rope. “And now for the highlight of the tour,” announces the guide, pointing at the cliff edge in front of us, adding, with an enthusiastic smile on his face, “We’re jumping!” I don’t mind letting the others go ahead, because jumping into a small pool from such a height lets my heart skip more than just one beat. But, at some point, even I am standing right at the cliff’s edge as I look eight metres down on the rock pool created by the water. I close my eyes for a second, feel the adrenaline in my veins. I concentrate fully on my landing spot in the centre of the pool and then jump with all my power. I did it! On the remaining way out of the ravine, I already feel the excitement for the third course of my adventure menu — the kayak tour on the Saalach river! 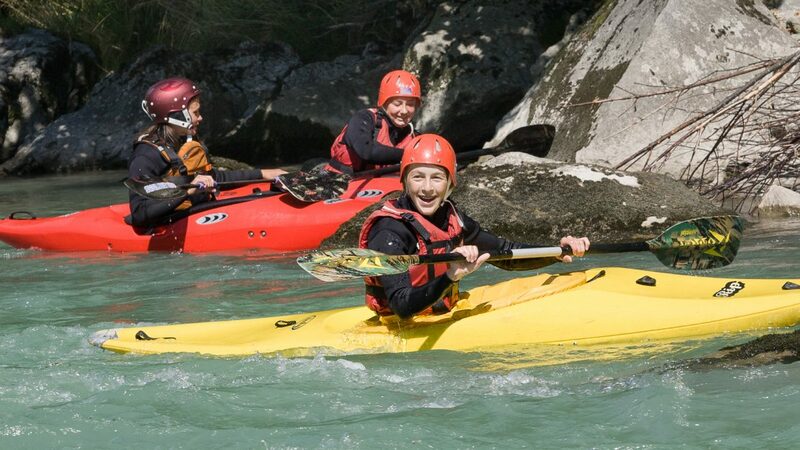 For kayaking beginners, Salzburg’s Saalachtal provides a multiday course that begins in still waters and a few easy practices. Only when you have full control over all the techniques, you get to go on the Saalach river. However, since I had already learned kayaking during a sports week at school and had already passed a few river excursions, I book a privately guided river tour on one of the Saalach river’s calmer stretches. Neverthless, I first have to stop by the Ritzensee lake in Saalfelden to refresh my technique. Next to the wetsuit, swimming vest and the helmet we add a spraydeck to prevent water from entering into the kayak. Slowly but surely, I’ve got the right paddle moves for maneouvoring through the whitewater all figured out again. Finally, we also get to practice the kayak roll which I can use to quickly turn around again after an involuntary flipover of the boat. After a few unsuccessful attempts, where I open the spraydeck underwater in order to get out of the kayak, I feel that I have enough self-confidence for my first river ride this year. Together with my guide, I drive to St. Martin, where we take the kayaks off the hanger and pull them through green meadows to the Saalach river. We get in and push ourselves away from the shore. The journey begins calmly and I have enough time — as opposed to with the lake — to get used to the more animated water. After a short time, we head for a swirl to take a break. Two, three powerful paddle strokes and the tip of the boat turns toward the shore and finally rests in the calm water. “Let’s just practice a few maneouvres. We’ll start with crossing the river to the other bank,” annouces the guide and we begin straight away. With the help of the current and continuous paddle strokes, I make it to the other side of the river. But just before the safe swirl, a wave gets me to turn. A moment ago I was looking at the blue sky and the great meadows all around — and now I’m head under water in a kayak. After a second of panic, however, my body reacts instinctively and calmly carries out the previously practiced movements. Taking deep breaths, I dive back up out of the water and swim with the boat in one hand and the paddle in the other to the bank. Laughing about my ‘initation’, the guide walks up to me and together we already continue our journey. Practice makes perfect! Surfing across the little waves feels like a soft rodeo ride and we arrive at our exit point way too early.